looking for a used 688, with or without bag. I have at least 6 of these machines, all in need of attention. Two extender boards for the Nagra T audio recorder. Looking for Deva IV recorder with Rev C or D board. Bang and Olufsen. Beocord Model 1500. Tape Head Wanted. 2 Track. Makers Part No.8600010. 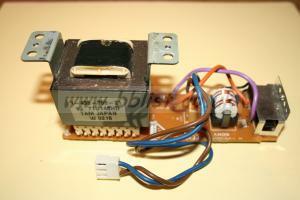 Power Supply Section for SONY MDS-E12 Professional Mini Disc Player/Recorder.Wanted. Looking for the Nagra T Audio and T Instrumentation recorders in any condition. Looking for the studio recorders TD-88 and TD-9 in any condition. Portable models will also be considered. Looking for the S20 model in any tape format and condition. Looking for any model of the last generation: A810-A812-A816-A820. Also D820X. In any condition. Looking for models PTR-1 (Frida) and TR-55 in any condition. Looking for Sony APR-5002 or APR-5003 tape recorders in any condition. Looking for CD players of the EMT brand, any model, working or not. I need advice with Aaton modded walkman Sony WM-D6C. It has blocked rec button - I don't know if it is designed to be?